Today was a hot day. Okay, so it only got up to 83 degrees, but that’s “hot” here in the national forest and mountains (we’re at about 2600 feet above sea level). We were really surprised to hear that it was hotter this week at the higher elevations along the parkway. However, we do know that the moment you drive into the forest to reach us on what we like to call our 2-mile tree lined driveway, the temperature drops by about 9 degrees. Nature at its best! With a break from this week’s thunderstorms, it was the perfect day for a spin on the paddleboat, so Brigette and Csaba hopped aboard for a late afternoon trip. 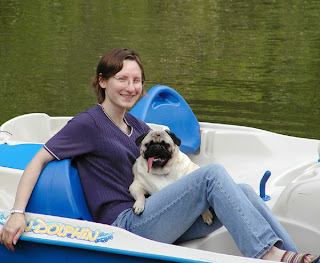 Csaba, being the paddleboat afficionado and spoiled pug that he is, relaxed on Brigette’s lap while she toured him around the lake. It never fails…no matter where he is, the always laid-back Csaba will find “The Lap”, which is his favorite place to be.